Short design times and fast change cycles drive earlier product launches. With PDXpert PLM software, your company will see revenue sooner and extend your production experience curve. PDXpert PLM software cuts time-to-market up to 75%. Launch your product several months early, and get a jump on your competition. Perhaps PDXpert PLM software's most remarkable impact on revenue is the substantial efficiency gained when processing product releases and changes. A non-automated process usually requires extensive document collection and copying efforts, repetitive and error-prone change order creation, and relying on time-consuming interoffice mail or on an engineer or change analyst walking the package from office to office. Involving supply chain partners may require express parcels, insecure or lost mail, irrelevant or incorrect file attachments, and a host of other time-wasters. PDXpert PLM software contains all product information in a secure central location; allows multiple users simultaneous access to the data; provides templates for change types, including pre-defined review workflows, approving departments and interested observers; identifies all dispositioning tasks and rolls up cost impacts automatically; and utilizes email so there is no lag between one person's approval and the next person's notification. Changes can typically be pulled back, reworked, and resubmitted without leaving your desk to chase down a physical package. Increasing revenue is just one benefit of PDXpert PLM software. 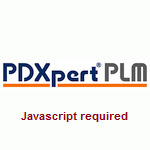 Download PDXpert PLM software to see how a PLM solution can help your company.